We have regularly scheduled Open Houses at both campuses. Please enter through the doors on Southern Avenue across from the Sacred Heart parking lot. Please enter by the rear door under the canopy. If you are unable to visit during our scheduled Open Houses, please contact Dianna Chmelicek, Development Office Director, at 601.450.5736 or dchmelicek@shshattiesburg.com to schedule an appointment. You may aso Click here to request a tour of the campus or to request more information about Sacred Heart Catholic School. 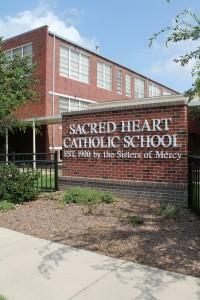 Sacred Heart Catholic School, a ministry of Sacred Heart Parish, anchored in the Christian faith, focuses on individual growth, academic excellence and service in a safe and nurturing environment.